The Museum Broken Arrow is hosting a ribbon cutting and exhibit hall dedication, Thursday, April 18th, 4:30 p.m. 400 South Main Street, Broken Arrow, according to Julie Brown, Executive Director. “The Museum Broken Arrow is proud to dedicate our 1st-floor exhibit hall in honor of Barbara Brown Kimbrough. With this being the 10th year of the museum’s existence, we felt it fitting to honor Barbara in this way. She played an integral part in getting this place up and running and for that, we are eternally grateful. Barbara was known for her love of the arts and her passion for promoting the history of Broken Arrow. We are thankful to the Brown Kimbrough family for their continued support of our mission of Keeping History Alive,” Brown said. A reception at the Museum, hosted by Water’s Edge Winery, is set for April 18 at 4:30 p.m. 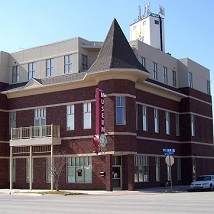 The Museum Broken Arrow is located at 400 S. Main Street, Broken Arrow.